Was just wondering where everyone buys their equipment from. Long and mcquade. <---- bought both my guitars from there. Where do you guys shop for your toys!!?!?!??! Nowhere specific, here in the deep south (of the UK). I tend to visit stores as and when the mood takes me. If I find something I like, I buy it. I gave up shop loyalty a very long time ago. good call, I dont really do it out of loyalty its just they have the best stuff in the area. I was just wondering if there was any really good ones, More so out their is Europe. yeah i know what you mean i hate going into them, There always kids playing a shity rendition of stairway. I go to Long and McQuade now. Had it with Steves. To much attitude on part of the staff. Not so much the Toronto store though, they were helpful. Got tired of waiting months and months to get stuff I ordered from Steves. 2 weeks = 6 months usually. Long and Mcquade are decent though. Favorites stores though are Manny's in Times Square and Sam Ash across the street. I like Long and McQuade and Tom Lee. The Music Store in Cologne, if you want a big, big store, but I like Max Herferts Instruments the best. It is an old shaggy cold hut in the outskirts of town, and Max is an ex boxchapion, a tough man with a soft heart and amazing instruments. It has the special smell of new instruments and books and beer and cigarettes in it and I could spent there hours! Steve's Music in Montreal is awesome too! There's Archambault that is cool. Elderly Music in Lansing, Michigan. 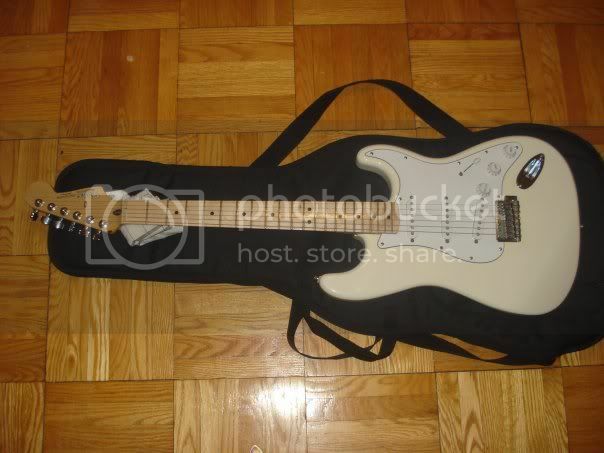 WWW.SAMASH.COM DECENT PRICES AND USUALLY GOOD SALES ON GUITARS. Emerald City Guitars, owned by long time entrepreneur Jay Boone has a bunch of cool, vintage gear located in the Pioneer Square District. Guitar Maniacs in Tacoma....this guy, Rick King sells guitars to Jimmy Page..... that makes him cool in my book!! Rick was buying old Strats back when they were new. Dusty Strings is THE place to buy an "upscale" acoustic guitar.... this place requires a very thick wallet, but if you want a choice Martin or that level of professional guitar in "brand new" condition it is the place to go. Located in the Fremont district, very near the bridge. My secret place is located in Sumner, WA and is called Affordable Guitars. Kevin Lundsten has a nice store full of used and vintage gear at affordable and extremely expensive prices. If you don't see it in his show room, just ask.... he has a "vault" full of VERY NICE vintage instruments that he keeps "tucked away" for collectors like me!! I've been buying guitars and amps for a while!! 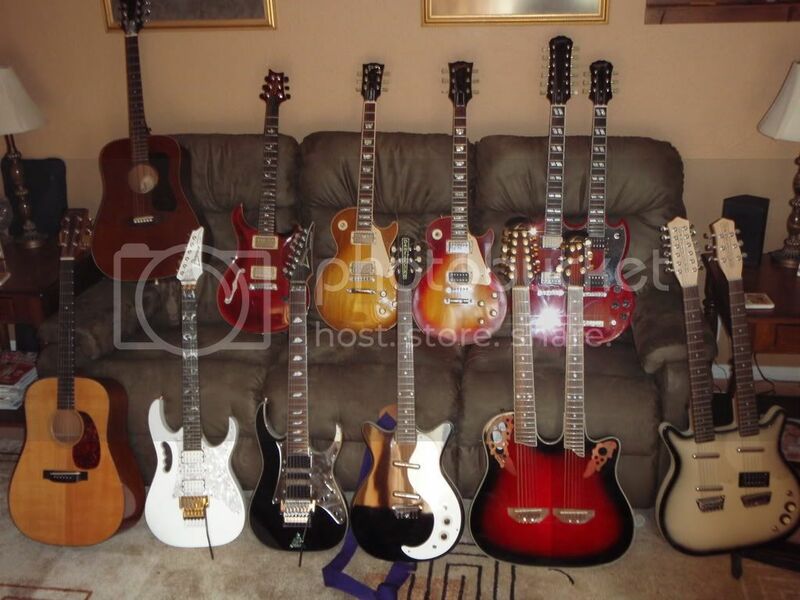 haha nice collection man, Im loving the double neck ovation and danelectro. How much did they cost if you don't mind me asking? They are the cheapest guitars in the picture! The '71 Les Paul Cherry Sunburst cost me $600 ....a long time ago! The '95 Amber burst was around $1200, ten or more years ago. The Guild was $350....a long time ago. The Martin was $2500 in 2001. The Ibanez 7-string:$1000, the Jem 7 VWH was $1200, both used, but in mint condition. The EPI double neck was $1000, brand new. The Danelectro was $150, brand new, Double neck Dano was $400, brand new. The Ovation Double neck was $700, from a factory authorized refurbishing shop...the bridge on the 12 string was reinforced, but it is in brand new condition. I buy low and watch them go up in value...I couldn't afford the '71 at today's price! haha nice, its true to get a nice older guitar now cost an arm and a leg i cant believe you got the double neck ovation for that cheap im amazed. 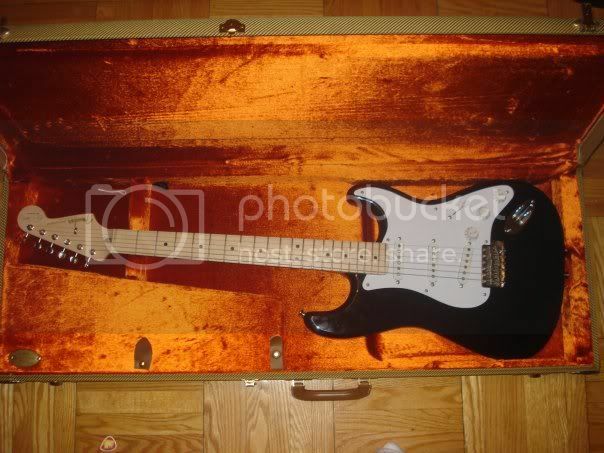 My mim strat was about $600 3 years back and the Blackie Clapton one was around 1,600 before tax but i love every minute of it. How do you judge what goes up in value and what doesn't? Gibson Les Pauls, with sunburst go up faster that most solid colors, except pre-70's Goldtops. Epiphones go down in value. Martin and Guild acoustics tend to gain value. There are books about it. I'm a bit out of the loop lately and tend to just play the things and don't worry about their current value! and, of course, there's always Guitar Center.